Our identity is a fluid, continually evolving thing. The different components of our identity rise and fall in importance depending on the context and their relevance, and the roles those components play vary accordingly. There are aspects of our identity that do not change, and there are aspects that come and go. For instance, I have always been and will always be a woman. This is an aspect of my identity that doesn’t have much importance if I am reading a book or playing with the dog, but it becomes critically important if I decide to bring a new life into the world. On the other hand, my identity as someone who writes computer code is relatively new, and will only remain for as long as I continue to write code. Illness is something that attaches to our identity. If we are infected with a cold, we do not express it in that way; instead we say “I am sick”. It has become an attribute of who we are, with the same phrasing as saying “I am blonde” or “I am hungry”. For most people in most instances, this addition to our identity is removed in a few days, perhaps after a week, and our identity changes again. We say “I am better” or something similar, and are able to replace the negative identifier with a new, positive one. When illness is not cured, however, we don’t go through the process of restoring our former identity as someone who is not sick. The longer we wear that negative badge, the deeper it presses on us, into us. We are used to shaking off illness in a negligible amount of time, and so this new aspect rises in importance. “I am sick” is a statement that needs to be dealt with now, not in a day, a week, a month or a year. It is more important than identifying statements such as “I play tennis on Tuesdays” or “each year I go hiking through the mountains for a week”. As illness continues it becomes chronic illness. This is the place where identity begins to suffer. It has been at the top of your awareness for so long that other aspects of your identity are stripped away. How can you call yourself someone who plays tennis on Tuesdays when you haven’t stepped onto the court in six months? Are you really someone who goes hiking through the mountains every year when you’ve told your friends that you will sit this one out? With every realisation of what we have lost, we step closer to our personal abyss. “Who am I?” is a question that has to be asked. If the only way you can answer this question is to say “I am someone who is sick” then you are staring into the abyss. You have given it too much attention, too much importance, and now it is consuming you. None of us want to stare into that abyss. It means seeing all we have lost, all that has been sacrificed, and all that might never be again. You realise that “hitting rock bottom” is a myth spread by people who think they were there only because they have no idea of the many things they still have left to lose. But you know, and if you stare into the abyss then you find yourself wondering what else will be sucked into it. As long as you keep breathing, there is still more to lose. Stepping back from the abyss is the most obvious thing to do, and it is the focus of many programs that are designed to help people with chronic conditions. You might not be able to say that you play tennis on Tuesdays ever again, but you can still say that you enjoy listening to Mozart during dinner or reading XKCD cartoons. It is a conscious process to push the illness down your list of priorities, to see all of the things that remain, and to embrace what is left. The problem with this type of therapy is that it will never solve the real problem, which is being sick. Life becomes a carefully constructed series of behaviours and habits that provide equilibrium. We hold the stories that we tell ourselves like a talisman to ward off further evil. “If I do all of these things, I can get through the day.” We have stopped fighting the monster, and instead we have struck a deal with it. Consciously ignoring the abyss saves us from its return gaze, but the price is to accept it as an unchangeable part of who we are. For good or ill, we have become the monster. This morning I went to the hairdresser for the first time since I was pregnant. It was a bit exciting to sit back and let myself be pampered while my child was off having adventures without me. The cut was quick, but it was half an hour that seemed long because it came without interruption. My hair isn’t high on my priority list. When the hairdresser asked me how I wanted it cut, I described the lowest maintenance style that I could think of, she asked a lot of questions that I didn’t understand, and I replied with “sounds great” while hoping none of the terms she used were secret code for a fringe. Her interpretation of my vague description was exactly the style I had when I was in my late teens. Since starting the paleo diet, I’ve lost 18kg. I now weigh what I did in my late teens. My new jeans are almost the same style that I had in my late teens, and most of the clothes that fit me are ones that I retrieved from the back of the wardrobe (last seen in my late teens). Visually I only need a bit of acne to complete the transformation, but I’m happy to skip that step. Since moving back to Melbourne we’re living with my parents, so I spend most of my time in the same room that I did during my late teens. When I’m not looking after Shroomi I tend to do a lot of work on the computer. I’m relearning how to program, which is something that I abandoned in my early 20s, and I’m picking up other hobbies that have been neglected for years. It feels as if I am returning to a path that I regret leaving. Each tiny change is a small readjustment, almost insignificant in itself, but collectively they feel like shedding baggage and rejecting past mistakes. In my late 20s I was told that I could never unwind the clock and I could never regain who I had once been. That might be correct in the details, but I am learning now that it is not correct in the emotional landscape. As I return to the point where my path deviated from where I wanted to go, I wonder how walking this road will be different now compared to then. I have the added wisdom of over a decade of hard learning to draw on. Will I be able to conquer the challenges that thwarted me in my youth, or will they be just as difficult now as they were then? Will I be hindered by what I have learned, or will it benefit me? Will I be comfortable with all the things that make me authentically me? Only time will tell, but now I feel as if I once again have all the time in the world to find out. After years of discussion and general procrastination, I finally took the plunge and bought myself a standing desk. Today is the first day that I am using it, and I’m already convinced it was the right thing to do. 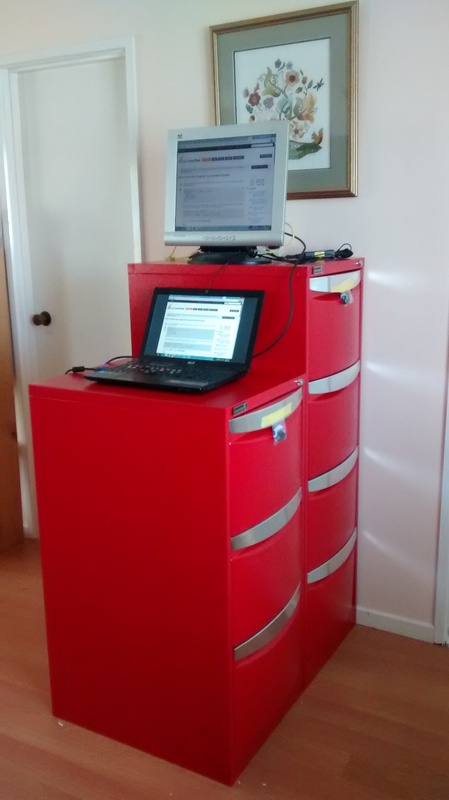 My original plan for a standing desk had been one built around a treadmill. Standing still isn’t much better than sitting still, and the treadmill would have given me the incidental exercise during the day that I generally lack when I am working. Since the arrival of Shroomi, however, my incidental exercise has risen enormously and my desire for moving objects that little fingers could get stuck in has plummeted. The old standing desk design was out, and I needed something new. For the last few months I have been working from the back of a tallboy. It has been a nice alternative to my regular desk, but the height on it was a compromise between the height I needed for the keyboard and the height I needed for the monitor. My shoulders were always slightly too high and my neck was always slightly too bent. I couldn’t use the setup for very long before fatiguing. During the week my partner found the dimensions for the proper setup of a standing desk at iamnotaprogrammer.com. We got out the tape measure and worked out what the numbers would be for my body. He was keen to go with the suggested Ikea solution, but I wasn’t thrilled about it. It’s not that I don’t like Ikea’s products, it’s just that I hate their store design so much that it tends to influence my opinion of what they sell. I kept looking for an alternative that didn’t require going to Ikea. I went through a few local furniture stores to find pieces I could combine with each other. My initial idea was that I could put one piece on top of the other and bolt them together. Nothing I found fitted this plan, so I changed tactics and decided to look for pieces that I could put beside each other. Red, because you always want your desk to go faster. The pair of cabinets cost me $659 at Officeworks, which I was happy to pay since these are bright red and totally hot. No assembly was required, and when I rang the store to tell them I was coming they had them ready at the front door for me to collect. The boxes that they came in are quite sturdy, and my Ikea loving partner has decided that he might use them to make a standing desk of his own. Shroomi has had a great time thumping them, so I need to fill them quickly with something to kill the noise, but they are lockable so I don’t need to worry about her getting her fingers stuck in the drawers or tipping anything onto herself. Has anyone else tried a standing desk? What worked for you and what did you need to change? Where Is This Female Programmer? I have been reading a lot of articles recently about women in IT, sent to me by various people. They all relate to the same general question: why aren’t there many female computer science students? It is a question that is getting closer to home with every day, and I have spent a fair number of hours pondering this question as it relates to me. In high school I picked classes that were highly specialised according to my teachers. My final year was an intense blend of mathematics and computing. I learned to program in several languages and I learned enough high level mathematical skills that there is very little in my life that I am not able to calculate if I need to. After finishing school, I went on to complete a BA with a major in creative writing. My other units were in literature, linguistics and philosophy. I took this further a few years later and completed an Honours year, also in writing. Aside from coding a basic website for myself over a few weeks one summer, I haven’t touched programming since. Looking back with the vantage point of a few years, I am surprised that I didn’t complete a double degree in computer science and art. It would have been the logical choice given my interest and skills. My two main interests would have been combined, and I would have been able to follow a very different career path where I suspect I would have excelled in both fields. The problem with retrospective insight, such as this, is that the awareness now was not available then. My first round university selections were all in various business fields: accounting, economics, marketing, etc. The only reason I enrolled in the degree that I did was because on the final day to change our preferences my former drama teacher mentioned her surprise that I had not selected a creative writing degree. I didn’t realise such things even existed, so I went home and put down the first one I could find as my first preference. I didn’t have the time to research degrees, because I literally had a deadline of two hours to do the work and the website was prone to crashing. My academic future changed instantly as a result of a 3 minute conversation. I didn’t understand what the options were that I could follow. Computer science had always been an area that I saw as hardware, not software. I could build a computer from component parts without help, but it wasn’t something I wanted to do all day. I didn’t see a future career that involved cutting myself open on circuit boards. Programming was absent from my mental list of possibilities. Now that I am in my early 30s, and I am aware of how many women are making choices similar to my own, I question if it was the right choice. I am certainly young enough that I could go back to university – I’ve done it a few times before – and correct the career mistake that I made. It would be an opportunity to gain a qualification that makes sense, I could complete my family with no time out of the workforce, and I would be young enough that I would still have a long career ahead of me. I am also old enough to understand that there is more than one way to achieve a goal. Programming tutorials abound on the internet, and I know enough programmers that I could get help with any problems I encounter if I teach myself. Do I want to learn this to balance the numbers in a grand feminist statement, or do I want to learn this for myself? I’m all for promoting the sisterhood, but I’m just as happy to live my life and save a ton of money in the process. For the first time in years I am living in a house that has a working telephone. There are probably benefits to this beyond a discount on the internet, but I am at a loss as to what those benefits might be. It is constantly ringing with incredibly rude and obnoxious sales people who just don’t get it. I’ve spent enough years working in customer service to appreciate that it can be a demeaning and thankless job. I’ve had my share of hostile customers who don’t understand that I have a job to do and have not woken up in the morning with the specific goal of ruining their lives and general happiness. I’ve had to keep my cool when I want to tell someone my opinion because I also understand that when I am a customer service representative I am the face and voice of my employer in that moment. Because I understand that customer service jobs aren’t as fun as the employment advertisements make them out to be, I try to be compassionate when I am dealing with customer service people. No matter what I am doing when they call me, I make sure I treat them like people. When they ask in their script how I am, I also ask how they are. This is a rare response, because almost every customer service representative I speak to is surprised and I am often told that I am the first person in the day to ask them. It costs me nothing to offer basic courtesies, but seems to make them happier. Because I understand that customer service jobs aren’t always easy, I try to be polite when I reject their sales pitch. I don’t just tell them that I am uninterested in their product or service; I also take them time to tell them why. I understand that they have sales targets, and I understand that my call is going to be recorded for “quality and training purposes” so I want their managers to know that the lead was too cold to kindle. If I was the customer service representative at this point, I would have thanked the customer for their time and said goodbye. It is a polite way to end the call that does not alienate someone who has been polite to me. Instead there was just the sound of my phone beeping to indicate that he had hung up on me. Clearly I was a dead lead for him today. But, just as clearly, I am a customer who has had an electricity account in the past, and I am probably a customer who will have an electricity account again in the future. And will I consider Simply Energy for my future electricity needs? Of course not, because they just interrupted my day and took the opportunity to be gratuitously rude. I get hung up on a lot by customer service representatives that I make an effort to be polite to, and this time it got to me, so I decided to take the direct approach and I rang the company back. Their response was to leave me on hold for eight minutes before I got bored and hung up. To put that in perspective, their sales manager could have hung up on eight other customers in that time based on the length of my first call. I’m not able to disconnect the phone in this house because the account isn’t in my name – although a few telemarketers seem to think it is – and I’m unable to add it to the Do Not Call register for the same reason. For now I am stuck taking these annoying calls, adding business after business to the list that I will make sure I never work with. I’d ask them to take me off their marketing list, but unfortunately they’ve already hung up. Does this keep happening to anyone else, or is it just me? Which businesses haven’t taught their employees how to be polite while cold calling?